After five seasons in the pros, Gary Resetar came to the realization that his playing career was over, he told The Portsmouth Daily Times. What he turned his sights to was managing, taking over the independent Portsmouth Explorers for 1994. "What I hope to put on the field is a very fundamentally sound team," Resetar told The Daly Times that April. "I'm not looking to do anything flashy. I'm not going to have all kinds of trick plays. It's going to be straight forward baseball." While Resetar started his managerial career that year, it also ended quickly. After one more shot at playing the next season, Resetar's career in baseball was done. Resetar's career began in 1988, taken by the Twins in the 17th round, out of Rutgers University. At Rutgers, Resetar amassed a total of 141 RBIs over his three years at the school, still tied for seventh all-time in school history. He got one of those RBI in a May 1988 contest. With the Twins, the catcher Resetar started at single-A Kenosha. He hit .276 over 40 games there. He then split 1989 between Kenosha and single-A Visalia. Between the two, his average stayed steady at .286, hitting two home runs and knocking in 45. Resetar made the move up for 1990 to AA Orlando. With Orlando, Resetar hit .278 over 95 games. He also hit four home runs and knocked in 44. In one August game, he went 4 for 4, only missing a triple for the cycle, according to The Orlando Sentinel. That season in Orlando was also his last in the Twins organization. Resetar returned for 1991 with the Indians, playing 59 games at AA Canton-Akron. He hit .227. 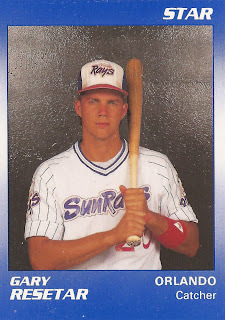 After not being recorded as playing in 1992, Resetar played 69 games in 1993 with independent Duluth, then signed on to manage Portsmouth for 1994, after taking a shot with the Rockies that spring. His stint there didn't last through July. Resetar is last recorded as playing in 1995, with two games at single-A Asheville. Resetar has since moved into the business world. In 2012, he was a project manager with a construction company called Flintco, according to Baseball Cards Come to Life!.